On my desk at work, there are these huge piles of paper that consists of magazines, reports, annual reviews, agendas, and any other miscellaneous document that has walked into my office, but never found its way out. 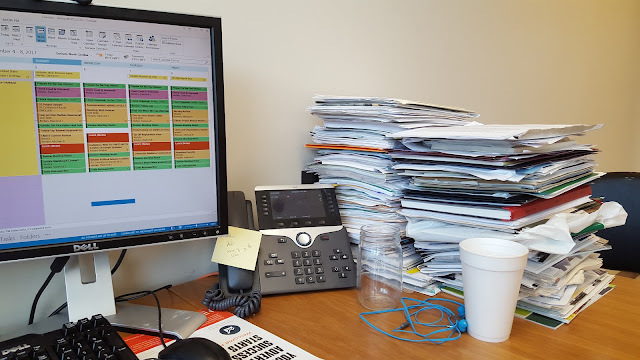 Every so often, I get a co-worker that makes a comment about how this pile appears to be getting taller or asks how long I plan on leaving this eye sore on my desk. My reply typically sounds like, "I am aware of the problem and plan to address it soon." Can I be honest with you? This massive pile has been on my desk for months and I've grown accustomed to it. Sometimes, I forget that it even exists. In my mind, I know what must be done to address this problem. It's going to take focused energy to sit down, flip through each document, trash old files, and store the ones I need to keep. Beyond those "simple" steps, I have this very strong "feeling" that it will happen...soon. Does this sound like you or someone that you know? Maybe you don't have some gigantic pile of papers like I do, but it could very well be that overrun closet, crowded garage, or pile of clothes sitting on your couch serving as your alternative dresser. You know, the pile where you extract a clean pair of the "unmentionables" each morning? Yeah, that pile! Don't worry, there are plenty of people who find themselves exactly where we are, but the question most want to know is, "How do I clean up this mess?" The easy answer, while not all that helpful to some, is by telling you to "Just do it!" You know, like Nike. Unfortunately, when the problem seems so daunting, that answer doesn't do the trick because that's exactly what you've been telling yourself all along, "Just do it!" Trust me, I know. It's what I've been telling myself, too. Good news! There is a bright side to all this and I'm here to share a few ideas. As with any task, but especially the large and overwhelming kind, we simply have to start small. Instead of trying to tackle the entire load in one sitting, it feels much more doable to grab a handful of papers and work through that pile. Depending on the level of detail, this amount of work may only amount to a few minutes. If, after you've completed that first load, you feel like going back for more, do exactly the same thing and grab another handful. What I have found in my few short years is that getting started is usually the hardest part of the job. By starting small, you tell yourself that it will only take a few minutes, which seems both easier and shorter than what you initially planned. However, once you get started, you may find that it's not as bad as you thought and you knock out more of the task than you anticipated. Even if you decide to stop after the first handful, that's OK. Just know that over time, this action will eventually result in a nice, clean, and pile free desk (or whatever you're problem pile consists of). When you're faced with a busy schedule, or just feel like you're burning the candle at both ends, getting the task on your calendar allows you to "set it and forget it." That's right, whatever task you need to address, start by putting it on the calendar. For many, a good 15 minutes is enough time to "start small" (see the first suggestion above). Once you've scheduled it, allow your mind to relax knowing that you will address it at a specific day and time. Now, should anyone ask you the question, "When will you address this pile problem?," you can respond with confidence and provide your sure fire details. In the event that you start small and schedule your time, it is quite possible that you will not finish the entire task in one sitting. When this happens, and it will, make sure that you book a meeting from a meeting (BAMFAM). This means, find another day and time on your calendar to continue the work you started. Ignoring this step could lead to a laundry list of tasks you've never finished; however, by taking a moment to BAMFAM, you are ensuring that the job will be completed in time. Unless this task is on your "Honey Do List" or apart of your daily responsibilities at work, which should probably serve as motivation enough, know that for most tasks you undertake, time is not an issue. That's probably why this "problem pile" has been allowed to stay as long as it has. Sure, that pile of papers is an eyesore to some and an embarrassment for others, but getting it done doesn't make or break you. It's just something that needs to be addressed. In writing that, I'm not saying that the problem pile shouldn't be addressed or merely kicked down the field, but if you're making progress and then scheduling the next focused session, then it's perfectly OK to take your time. Just keep going and don't stop until you've reached your goal. I hope you found value with this post. If so, please leave a comment in the discussion area below and share it with someone who you think would benefit from it. If you like this kind of information, make sure you don't miss a single article! Follow this link to subscribe to my newsletter and I'll deliver more content like this directly to you.